A host of fundraisers, special guests and Hospital staff were in attendance to celebrate the Orchard Garden project’s completion, as patient and fundraiser Mr Theo Iakimov cut the ribbon to officially declare the new development open. Designed to provide a tranquil area of relaxation and beauty for patients, visitors and staff, the Orchard Garden project has transformed the previously unused and unattractive courtyard in between the hospital’s Jigsaw Building and Pathology Department. The area now features a therapeutic courtyard garden linked by a sensory garden walkway to the hospital lake, where a newly constructed wooden deck – designed to be fully accessible – offers an area of peaceful retreat overlooking the water. The celebration event is a culmination of over two years of fundraising, with hundreds of local people, community groups and businesses having donated towards the £160,000 of funding needed to complete the project. The garden was significantly supported by Dorset Cancer Care Foundation – who administered a legacy from the late Betty Hyam – as well as the Tesco ‘Bags of Help’ programme that contributed £12,000 after local shoppers voted to back the project at the checkouts. Touchingly, over £35,000 of the total was donated in-memory of former patients who were never able to enjoy the benefits of the garden but who received treatment during its construction. 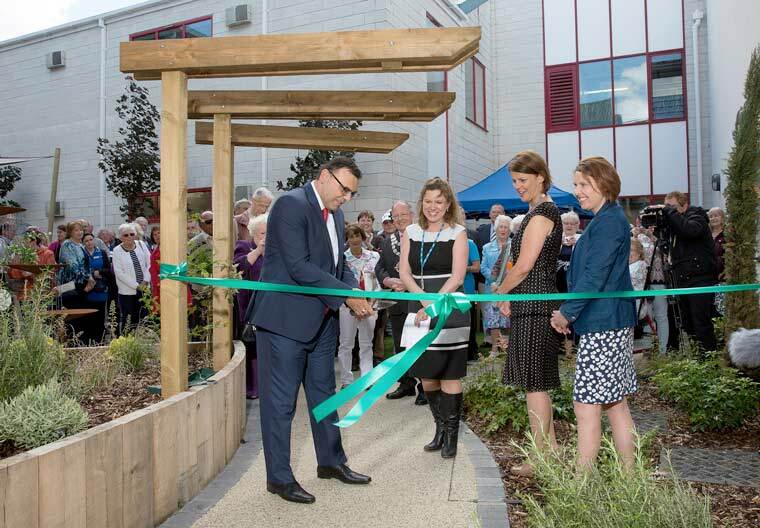 Alongside Mr Iakimov, Dr Helen McCarthy, consultant haematologist and Paula Shobbrook, director of Nursing and Midwifery, shared the honour of cutting the ribbon to formally open the new Orchard Garden. The Mayor and Mayoress of Bournemouth, Cllr Lawrence Williams and Mrs Elaine Williams were also in attendance. Dr McCarthy believes it will help improve the experience of inpatients during their stay in the hospital. “A patient’s environment is a vital element to therapy and can have a really positive impact on their experience at what can be a frightening and difficult time of their lives,” says Dr McCarthy.